Launched as a way of collecting and analyzing industry findings, the State of Chargebacks survey reflects the experiences of more than one thousand respondents in the card-not-present space. This report is a snapshot of fraud and chargeback management in organizations of all sizes, from all areas of the world, and across multiple industries. These in-depth survey results uncover firsthand encounters, experiential insights, and actual performance metrics related to managing and mitigating fraud and chargeback risk. With statistics covering online, mobile, and omni channel commerce, the report is designed to outline trends and patterns in fraud prevention and mitigation. 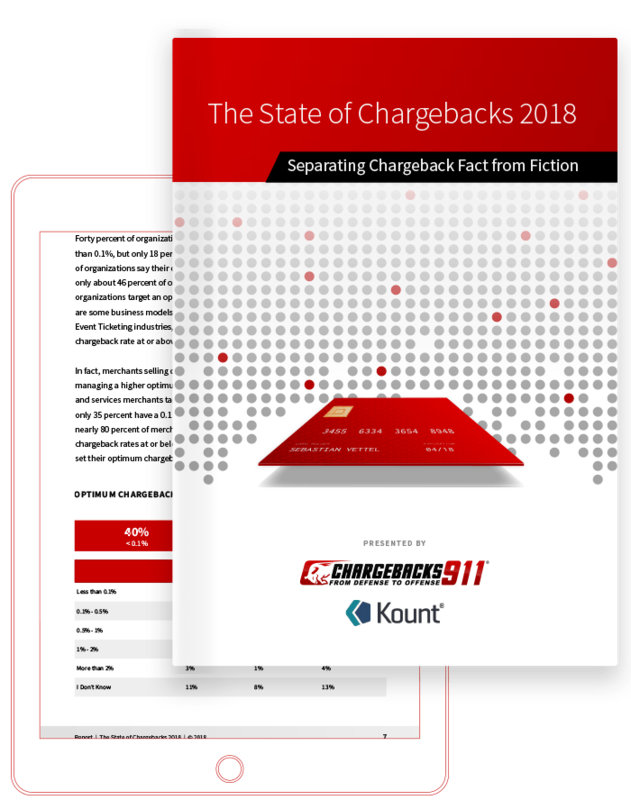 The State of Chargebacks: 2018 Report, brought to you by Kount and Chargebacks911, is intended to provide an overview of the health and status of chargeback management in the Card Not Present (CNP) payments space. It includes key facts and figures about chargebacks, dispute and win rates. In addition, participating organizations shared insights about the tools, services, and solutions they employ for fraud detection and chargeback management, as well as the greatest challenges they face. Participants in the survey included a diverse audience of more than 1,000 respondents primarily representing online, multi-channel and mobile commerce merchants. More than 82 percent of participating organizations reported they are disputing chargebacks today. Yet even with this high percentage, additional survey results indicate organizations may lack expertise or struggle finding success with the representment process. About 40 percent of organizations that dispute chargebacks are representing more than 60 percent of chargebacks incurred. One-fifth of merchants win less than 15 percent of their dispute cases; more than one-third win less than 30 percent of their disputes; and nearly one-quarter aren’t aware of or don’t keep track of their win rates.